One technique for dealing with sideways moves within a trading chart channel is to draw horizontal support and resistance lines off pivot points. Technical traders use the term pivot point in a few different ways. One standard definition is that the pivot point is the center bar of three bars (or more) where the center bar is the highest high or lowest low. Another definition of pivot is the median price (the numerical average of the high, low, and close). Today, this version is probably the most accepted. Add a factor to get upside resistance. 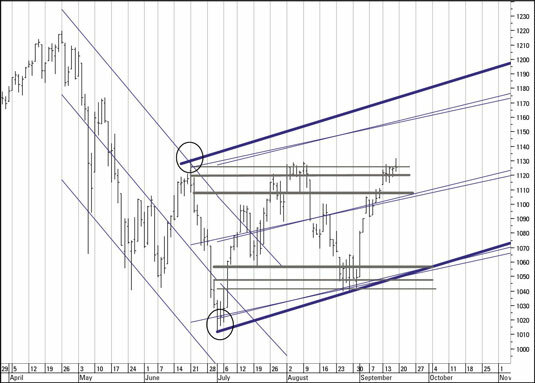 Subtract a factor to get downside support. Multiply the pivot point value by two. From the number you calculate in Step 1, subtract the low of the pivot day. The result is named R1. Multiply the pivot value by two. From the number you calculate in Step 1, subtract the high of the pivot day. This procedure sounds like a lot of arithmetic, but don’t sweat it. It’s easy enough to do in a spreadsheet or by hand, and many trading platforms offer it as a standard option. Plus, the procedure itself is quite sensible — you use a multiple of the median price to estimate a range going forward that subtracts the high and the low to yield a norm. Any price higher or lower would be an extreme. If the upcoming price breaks the horizontal support and resistance lines calculated this way, the direction of the breakout is your clue that the trend is truly over. 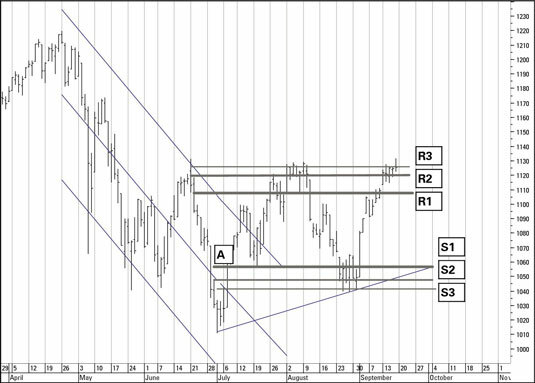 In this figure, R3 is very close to the highest high and S3, while higher than the recent lowest low, meets the hand-drawn support line connecting two lows. When many market participants are looking at the same pivot-point lines, you can expect price movement at exactly those lines. In the case presented in this figure, if you bought at Point A, you’d set your target at R1 if you’re risk averse, R2 if you’re an optimist, and R3 if you’re swinging at the bases. Note that a test of a previous high is commonplace in a bounce off a low. If you’re able to go short, you may sell at R3 and target a gain to S3, which conveniently meets the hand-drawn support line. What’s important about the pivot-based support and resistance lines is that they effectively outline a period of activity where traders don’t know the trend. Bulls try to make a new high and get only a few pennies worth. Bears try to make a new low but fail to get a significant lower low. Pivot analysis is most useful in periods of congestion or sideways action after an old trend has ended and a new one has not yet emerged.